“Rose MacGregor laughed and she shouldn't have.” What a great opening sentence. The book and the character of Rose are set up in this simple phrase. The awkward, yet joyful nature of Rose and her freedom to laugh, especially when she shouldn't are essential to this character. Set in the heart of the feminist movement, this first novel by Marisha Chamberlain is filled with fluid, slippery writing; delicate and feminine. This is chick lit that reads like a symphony in three movements. The first movement is the emergence of Rose. As she blooms into her new career as a professor and composer at a university, she also finds herself experiencing the closeness of love and romance with a woodsy Guy Robbins. He sat tall in his seat and, despite the silver in his hair, his face was unlined and youthful. He drew a couple arcs on his chest and pointed, indicating her beads. She would remember that Guy Robbin, in his first gesture to her, had pointed to his own heart. The idea of careers for women is just beginning to get popular and Rose's talent has led her to a non-tenured position of prestige in the college classroom and she is gaining notoriety with her musical scores. Faced with impending motherhood and the end of her career, she terminates an unexpected pregnancy and pushes away Guy's offers of marriage. The anguish of Guy is written as concisely as Rose's tortured and truthful decision-making: an excellent balance on a still-touchy subject. The book starts to falter during the second movement; a stage in Rose's life she calls “Eden” and lives with other women musicians on a farm-like commune. She is invited by her mentor Lila, a famous cellist. The character of Lila is disturbing on a subtle level and it's hard to tell if it is meant to be written that way. Rose's almost romance with Lila just doesn't make sense and the rest of the text is filled with tired lesbian clich?s of women working without shirts in the hot sun, and making love openly. The plot seems to go stagnant on the farm and is rescued only slightly with the entrance of Rose's sister Natalie. Guy looked over. 'Hi,' he said unsteadily. 'I feel as if I know you,' said Natalie and smiled and cast her eyes down to her belly. What did she mean, know him? Rose hadn't mentioned Guy to Natalie since some crazy phone calls way back when Rose and Guy were first courting, more than a year before. Pregnant, stubborn, and stealing the heart of Rose's ex-boyfriend Guy, I think I have read this exact same plot-line in quite a few novels. In fact, it may be this double-clich? that almost makes the reader stop reading. They shouldn't. 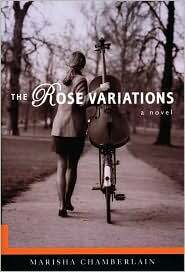 The book gets better as Rose moves into the third movement of her life and gains a deeper understanding of herself. The writing picks up and the excitement of possible tenure, a symphony, and new love fill Rose. The sections in which we see Rose writing music, and in particular her final symphony, are where Chamberlain's unique writing style shines. Rose doesn't get everything she wants, but that's what makes the book believable and that's what makes us love Rose and all her variations.